TROX slot diffusers type VSD15 are generally suitable for continuous assembly and can be inconspicuously installed parallel to linear light arrays. The air discharge direction can be adapted as necessary to the desired room conditions. TROX slot diffusers type VSD15 are deployed primarily in applications in which suspended panel ceilings leave a narrow gap of only 16 mm in width. The type VSD15 type is suitable for installation in rooms ranging in height from approx. 2.60 m to 4.00 m. They offer high induction, resulting in swift reduction of the supply air temperature differential and the air discharge velocity. The recommended volume flow range is 25 to l/s · m, while the permissible supply air temperature differential stands at ±10 K. The stable discharge behaviour type VSD15 slot diffusers makes them suitable for use in systems with constant or variable volume flow. 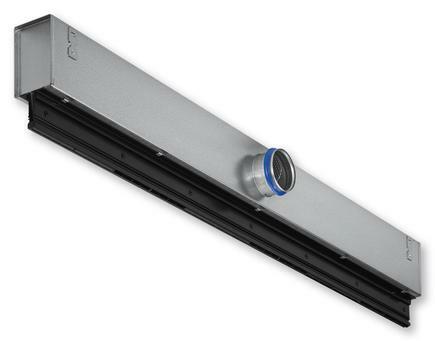 The air discharge direction can be adapted as necessary to the desired room conditions. Slot diffusers type VSD15 are supplied with rear-mounted plenum box, whereby the air duct system is connected via the side-mounted round spigot.